Combine the largest American television audience in history with the greatest revolution in communications since the telephone and consider the power of the conversations that happen - millions of humans connecting in real-time at a singular Super Bowl party. When a company tries to turn that party into it's own branded lottery, it clearly shows that many marketers still don't understand the connection between TV and social media. While the phrase social TV is widely described as the combination of any social media platform and a television broadcast, for the purpose of this post I will refer to the intersection of just Twitter and the Super Bowl broadcast under the umbrella of “social TV”. Fewer brands used Facebook and Instagram for real-time conversations during the game this year and while there are still a few outliers left in the television specific space, TVtag, Viggle and ZeeBox don’t move the needle enough to be included in this larger discussion. 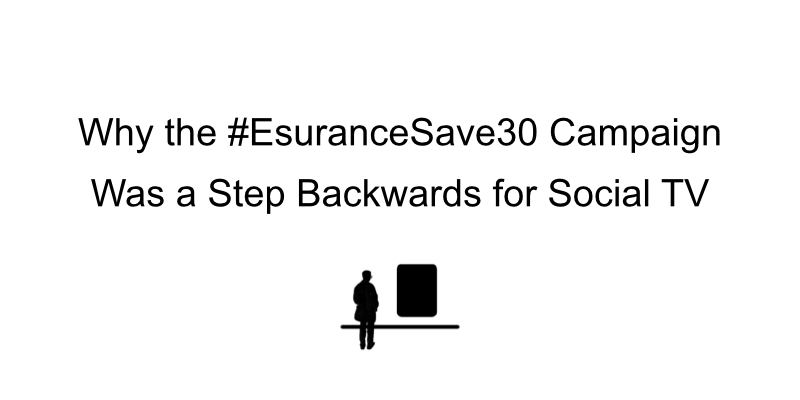 The premise was seemingly simple, Esurance would buy the first commercial after the Super Bowl, saving $1.5 Million dollars (over the $4 Million dollar in-game price tag) and then give that money away on Twitter using the hashtag #EsuranceSave30. Thus passing on the roughly 30% discount to consumers, the same amount consumers could save on insurance by using said company. What was intended as a simple cash giveaway made Esurance look like the Twitter equivalent of Jack Nicholson’s Joker making it rain on the citizens of Gotham. Measuring social TV success starts with understanding the goals of each brand and the cost of the campaign, but it can be assumed when a company participates in live-tweeting or attaching a hashtag to the biggest event in American television, they are hoping for social media exposure, engagement and perhaps even the holy unicorn of brand social TV “the viral tweet." All of which leads directly to sales right? Not so much. Not all exposure or engagement is equal and a viral tweet is not something that can be manufactured on command. Social media can influence purchasing best when brands become a trusted part of consumer’s everyday life and even integrate into his or her viewing habits, not via poorly executed stunts. Without a doubt, a $2.5 million television commercial right after the Super Bowl, which includes a celebrity and a hashtag, can draw attention to a social media presence. However, what is most important is how that attention is converted into a relationship. When a brand uses social TV as a novelty entry mechanism for a sweepstakes it cheapens the relationship between TV and the Twitter user. Instead of using it to for a conversation or to curate compelling content, Esurance chose to use the hashtag as a virtual Ping-Pong ball hopper. The process was intended to be simple, but was in fact too simple to allow the brand any control over the social elements of the campaign. 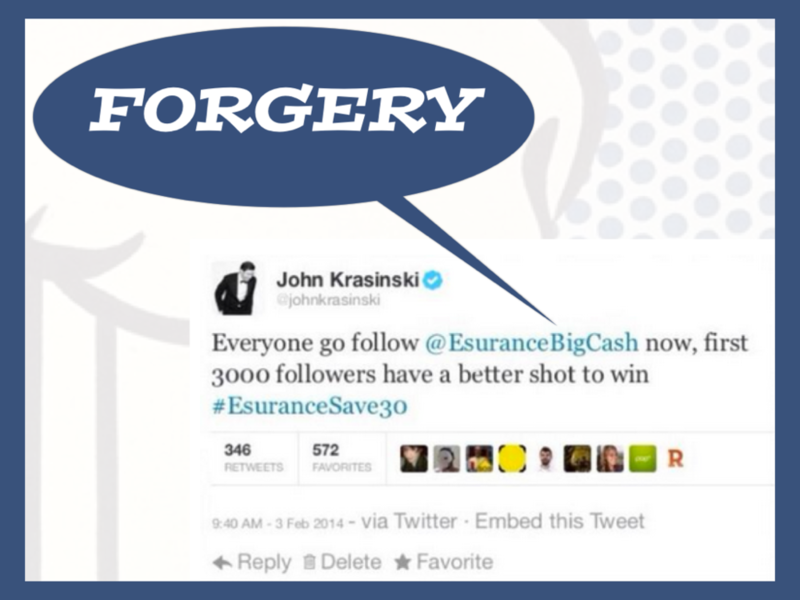 The Esurance commercial, official Twitter account and sponsored celebrity tweets all stated on the surface that a user only had to “tweet the hashtag #EsuranceSave30” to enter, while it very clearly stated in their contest FAQs (attached as a hyprlink in the tweets) that a user must be following the official account to be notified of winning. So in fact, users had to tweet the hashtag AND be following the official account in order to win. Esurance could have avoided much of the nefarious activity that followed by clearly stating this from the beginning, but they did not. And while users officially did not have to retweet (RT) anything to enter, scammers flooded the hashtag with tweets claiming that users would receive “extra entries” for RTs, Favorites and Follows of fake accounts. This absolutely had a HUGE impact on the number of times the hashtag was tweeted and related impressions. For the everyday Twitter user, the campaign quickly became a nuisance (at best) and for the new Twitter user, the chances they were hoodwinked by a “parody” account are extremely high. The entry process technically finished at 4am ET on Tuesday morning, but the hashtag continued with some momentum through Wednesday afternoon, allowing malicious accounts more than two plus days to phish without Esurance visibly doing anything about it. #EsuranceSave30 was tweeted nearly 4 million times according to Topsy, with a reported 2.6 billion social impressions, but how many of those were generated by fake accounts? And how did that all the "awareness" affect the Esurance brand amongst the Twitter community? One of my favorite social media pundits Augie Ray said it perfectly in less than 140 characters. The false belief that awareness ALWAYS leads to business outcomes is a disease that infects the social media marketing business. In addition to the massive exposure numbers, the official Esurance Twitter account gained over 200,000 Followers during the campaign. Starting with around 8,900 before the game and peaking as high as 266,000 (perhaps higher) on Wednesday, @Esurance is now around 224K (and dropping). Keep in mind an estimated HALF A MILLION users also followed fake accounts as a part of the hashtag free-for-all. The campaign came to a close with Jimmy Kimmel awarding the $1.5 Million to user John Intrater, of San Francisco. Mr Intrater claimed to have only tweeted the hashtag once and the “Live” giveaway seemed to authentically surprise he and his pregnant wife, which made for a nice sponsored integration on the TV side. In fact, for the viewers that only saw the TV side of this social TV campaign, which includes the commercial and giveaway, the whole thing may have appeared warm & fuzzy. As for the social side of the social TV campaign, it was simply a messy reminder of how many marketers and companies still don’t understand the potential power of Twitter and TV together. It remains to be seen if Esurance will develop a content strategy to capitalize on the new Twitter Followers gained through the sweepstakes, but It appears as of now to be a combination of cut-and-paste spam replies to sell insurance and a series of :30 YouTube commercials. While the spots are cute, neither of those behaviors are scalable to any type of meaningful, "always-on" Twitter relationship with the brand. Marketing via social media is about humans and relationships, not novelty gimmicks and empty statistics. Brands can’t just shout a hashtag, throw 1.5 million dollars at it and wait for the sales to roll in. To those of you claiming victory for the Esurance social TV campaign, I'm with Ian Schafer. Chart of growth in @esurance customers or it didn’t happen. 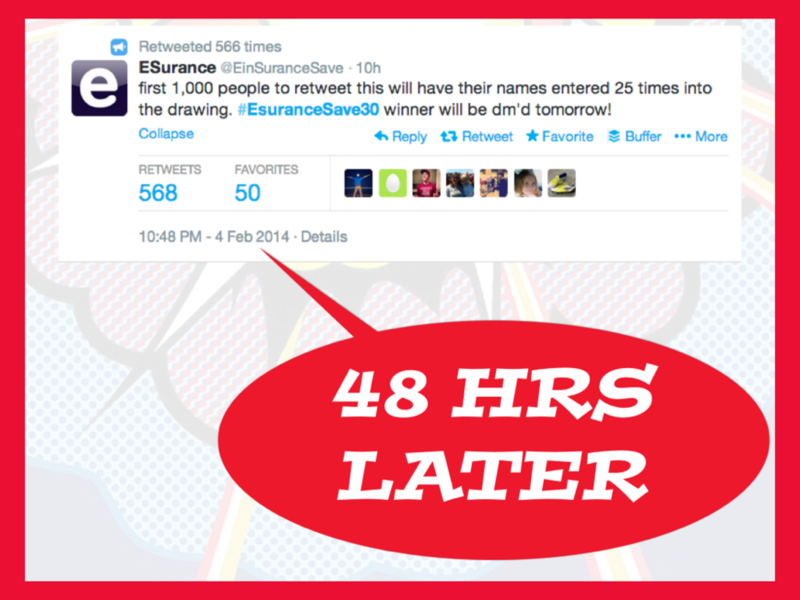 The #EsuranceSave30 campaign was the not the "winner" of social media for the Super Bowl. It was actually a huge step backwards in both thinking and execution. BONUS POINTS to H&R Block which must have placed a heavy Search buy on Twitter against the terms "esurance" and the hashtag "#EsuranceSave30" on Monday, thus drafting great exposure for their original content off of the sweepstakes. Are you buying the hype? Let's discuss. You can find me here. What do you think of the Esurance campaign? A. #SocialMedia coup B. Novelty #SocialTV mess. Hint: the correct answer is B.